Stored product or pantry pests include several beetles, moths, and a mite that can infest whole grains or processed foods. Usually, the first sign of a problem is the appearance of small beetles crawling over counter tops, moths flying across rooms, or caterpillars crawling up walls or across ceilings. The solution requires finding and destroying all infested products in which these pests have developed, a general cleanup, and use of sealed storage containers to prevent recurring problems. Some stored product pests feed inside whole kernels. These include the granary weevil, rice weevil, and the Angoumois grain moth. A much larger number of insects feed on processed grains or broken kernels, or a variety of spices. 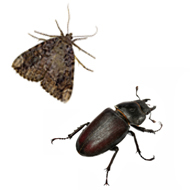 Common pests include the red and confused flour beetles, sawtoothed grain beetles, drugstore beetle, cigarette beetle and Indian meal moth. Flour beetles and the sawtoothed grain beetle cannot attack whole or undamaged grains but will feed on a wide variety of processed grains (flour, meal), as well as dried fruits, dry dog food, dried meats, candy bars, drugs, tobacco, and a variety of other products. The life cycle of the flour beetles takes about 7 weeks. Adult females can live for several months to more than a year. Confused flour beetles fly and are attracted to lights whereas red flour beetles crawl toward light but do not fly. Sawtoothed grain beetles neither fly nor are they attracted to light. Drugstore beetles and cigarette beetles attack almost any household food and spice and leather articles. Cigarette beetles are most commonly found in dried dog food and paprika. Drugstore beetles are often in bread, flour, meal, breakfast foods, and spices like red pepper. Adults of both species can fly and are attracted to light. The Indian meal moth is a very common household pest. The distinctive 1/2-inch long adult is easily recognized by the pale gray and coppery brown front wings. The dirty white to pink larval stage is a caterpillar that crawls away from the infested products to find a place in which to transform into an adult. The caterpillars feed on the surface and produce silk webbing throughout the food source. The life cycle can be as short as 25 days. They can feed on dried fruits, powdered milk, chocolate, flour, meal, dried dog food, bird seed and a variety of food. They prefer coarse flours and corn meal. "Our reputation is your best guarantee"
Copyright Domtech Pest Control Inc ©2015. All Rights Reserved.